Routine DNA sampling following a custodial arrest process is now the norm in many jurisdictions, but is it consistent with the Fourth Amendment? The few courts that have addressed the question have disagreed on the answer, but all of them seem to agree on two points: (1) the reasonableness of the practice turns on a direct form of balancing of individual and governmental interests; and (2) individuals who are convicted — and even those who are merely arrested — have a greatly diminished expectation of privacy in their identities. This Article disputes these propositions and offers an improved framework for analyzing the constitutionality of databases of biometric data. It demonstrates that the opinions on DNA collection before conviction have lost sight of the foundations of balancing tests in Fourth Amendment analysis. It argues that balancing is acceptable only for “special needs” or “administrative search” cases, for defining new exceptions to the warrant requirement of the Fourth Amendment, or for applying fact-intensive standards such as probable cause, reasonable suspicion, or excessive force. The Article examines how DNA collection before conviction might be brought under the traditional special-needs doctrine and how it might fit within a new, but coherent exception for certain forms of biometric data. 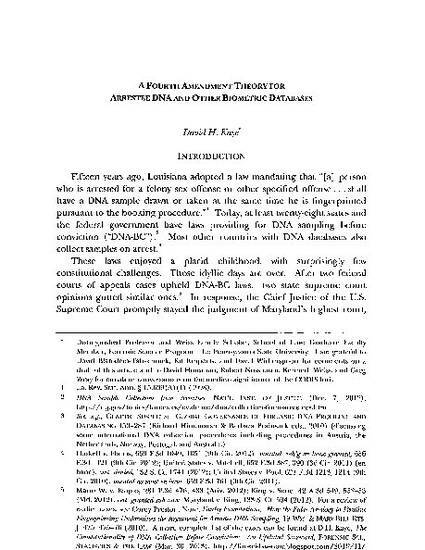 This framework permits the courts to analyze DNA databases without diluting the protections guaranteed by the Fourth Amendment, and it provides a sound rationale for the current law on arrestee fingerprinting. This article was originally published at 15 U. Pa. J. Const. L. 1095.